Welcome to our second installment of Everything Etopia a weekly podcast of news and updates. This wee k our podcast is all updates. Wow! What a busy week ahead. Are you a resident of Etopia? Do you have a business, product, or project you’d like us to promote? Drop a notecard to Namaara next time you’re in world with the details or email me at namaara at etopia island dot org. Happy Sunday! Welcome to another week and another update of Everything Etopia. If you haven’t had a chance to take one of the new walking tours or a wagon ride around Etopia Island now is the time to do it. Spring is here. Flowers are blooming. Snow is melting. Besides, it’s just plain fun. Coming up this month in Second Life is the Virtual Worlds Best Practices in Education Conference. Lots of great presenters, exhibits, and activities. It’s scheduled for the last weekend of the month and you can learn more at http://vwbpe.org. Etopia is sending out a warm welcome to Zinnia Zauber and her real world students from Penninsula College, Washington State, USA. Zinnia is a real world professor in Multimedia Communications and a passionate supporter of Etopia. If you happen to meet her wandering around Etopia make sure you give her a warm hello. This week’s schedule includes our New Resident Forum, tomorrow, Monday March 6th, at 5pm SLT. We’ll meet at the old Train Station, formerly known as the Poetry Corner. Want to know what happened there? Well, join us tomorrow evening at 5pm SLT for the New Resident Forum. Wednesday, the 8th, our friends from the Brain Energy Support Team will be sharing information about “How To Navigate Cognitive Challenges & Brain Injury.” That will happen at the Amphitheater at 11am and again at 5pm SLT. Thursday is the Weakly Bored Meating. It’s an Etopia staple. We invite you to stop by Tsidel’s Cafe at 7pm SLT and enjoy a fun-filled hour with friends. As an added incentive the hot dogs are free. Friday’s Happy Hour is at noon SLT for the convenience of our European residents. We’ll be at the piano bar on Etopia Prime, which is just upstairs from Tsidel’s Cafe. 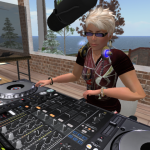 Saturday is Second Saturday Live Music is at Katja’s this Saturday beginning at 11am SLT. And on Sunday BEST will be hosting their monthly caregivers meeting. Be sure to visit Etopia Island dot org for a full calendar of events and more info about Etopia’s 1oth Anniversary and Earth Day Celebration coming up in April. Finally, we have a Partner Update! Visit Whole Brain Health and Inspiration Island for their all new Meet-Up and for Dani’s Sunday morning meditation class. You can find out more from their calendar at their landing area on Inspiration Island. That’s it for tonight. Tune in next week for more Everything Etopia.